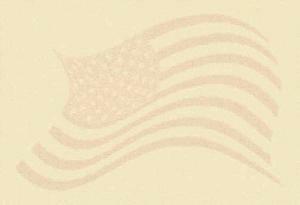 The following twenty photographs were provided to Historic Document Reproductions by Walter Fithian. He served aboard the USS MISSOURI (BB-63) from 1944 to 1945. During the ceremony, Fithian was positioned on top of the sixteen inch gun turret. The Official U. S. Naval Photographer assigned to the Battleship MISSOURI was also positioned near Fithian. After the ceremony was over, the MISSOURI's photographer immediately had access to the warship's photographic laboratory. These photographs are among the first images of the Japanese surrender ceremony printed. Fithian acquired a set. He was an eyewitness and he preserved a photographic collection that is remarkable and historically Significant. The photographs are shown and numbered in the sequence in which they were taken. Each of the representatives are shown in the order in which they signed the Instrument of Surrender documents. Click on the thumbnail of each photograph to see a larger version of the picture. 1. General of the Army, Douglas MacArthur and Fleet Admiral Chester W. Nimitz are shown coming aboard the USS MISSOURI (BB-63) prior to the arrival of the Japanese delegation. Their flags were raised on the warship to signal the arrival and presence of the senior American Officers aboard the MISSOURI. 2. The Foreign Minister f the Empire of Japan,Mamoru Shigemistu, arrives aboard the USS MISSOURI leading the Japanese delegation. Shigemitsu's credentials bear the signature of the Emperor Hirohito. 3. The Japanese delegation stands at attention waiting for the ceremony to begin. 4. General of the Army,Douglas MacArthur opens the ceremony. 5. MacArthur is shown ending his opening remarks. Standing directly behind him are the representatives of the Allied Powers. 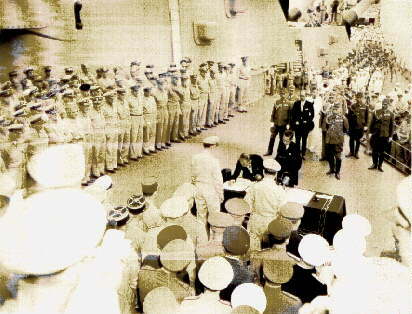 From right to left and standing in the order in which they would sign the surrender documents are : Fleet Admiral Chester W. Nimitz as the U. S. Representative, General Hsu Yung-Ch'ang for the Republic of China, Admiral Sir Bruce A. Fraser for the United Kingdom, Lt. General Kuzma Derevyanko for the Soviet Union, General Sir Thomas Blamey for the Commonwealth of Australia, Colonel L. More Cosgrove of the Dominion of Canada, General Jacques Le Clerc, Provisional Government of the French Republic, Admiral C. E. L. Helfrich for the Kingdom of the Netherlands and Air Vice Marshal Leonard M. Isitt for the Dominion of New Zealand. 6. 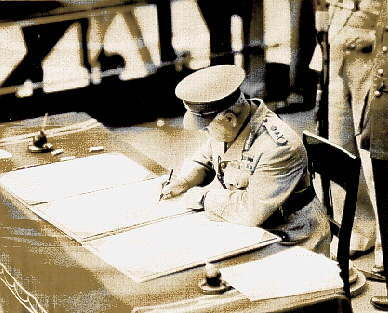 The Foreign Minister, Mamoru Shigemitsu, signs the Allied Copy of the Instrument of Surrender in a standing position. The papers laying on the right side of the surrender table are the credentials of the Japanese representatives. 7. This photograph was taken simultaneously with the photograph number 6 from behind the surrender table. 8. The Foreign Minister Mamoru Shigemistu signs the Japanese copy of the Instrument of Surrender document sitting down. 9. Signing by Command and in behalf of the Japanese Imperial General Headquarters is General Yoshijiro Umezu, Chief of the General Staff. 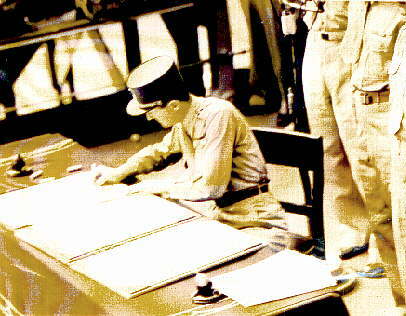 Umezu is shown signing the Allied copy of the Instrument of Surrender document. 10. The Supreme Commander for the Allied Powers, Douglas MacArthur is shown signing the Japanese copy of the Instrument of Surrender document. Standing behind him from left to right are General Jonathan M. Wainwright (captured after the fall of Corregidor in the Philippine in 1942) and General Arthur E. Percival the British Commander at the time of the fall of the Singapore garrison in 1942. Note: The photographer, Tony Spina, who took the signed surrender photograph featured on this web site is shown in the background preparing his camera for his historic photograph of Fleet Admiral Nimitz. 11. Fleet Admiral Chester W. Nimitz is shown signing as the Official U. S. representative. Nimitz is signing the Japanese copy of the Instrument of Surrender. This photograph was made almost simultaneously with the photograph featured on this web site that bears the signatures of the eight American war leaders. 12. General Hsu Yung-Ch'ang representing the Republic of China is shown signing the Japanese copy of the Instrument of Surrender. 13. Admiral Sir Bruce A. Fraser representing the United Kingdom is shown signing the Japanese copy of the Instrument of Surrender. 14. Lt. General Kuzma Derevyanko representing the Union of Soviet Socialist Republics is shown signing the Allied copy of the Instrument of Surrender. 15. General Sir Thomas Blamey representing the Commonwealth of Australia is shown signing the Japanese copy of the Instrument of Surrender. 16. Colonel L. Moore Cosgrove representing the Dominion of Canada is shown signing the surrender document. MacArthur is standing to his right. Tony Spina, the photographer of the signed surrender photograph, is shown and can be positively identified in this photograph. 17. General Jacques Le Clerc representing the Provisional Government of the French Republic is shown signing the Allied copy of the Instrument of Surrender. 18. Admiral C. E. L. Helfrich for the Kingdom of the Netherlands is shown signing the Allied copy of the Instrument of Surrender. 19. Air Vice Marshal Leonard M. Isitt for the Dominion of New Zealand is shown signing the Japanese copy of the Instrument of Surrender. 20. The ceremony has ended and the Japanese delegation is shown leaving the veranda deck. Peace had been restored to the world.